illus. by Emma Pederson. 32p. Pajama Pr. Mar. 2019. Tr $18.95. ISBN 9781772780673. PreS-Gr 1—Twice a day, Mama Quail leads her 10 chicks along a meadow trail while Papa "watches from above." All the little ones dutifully follow Mama, except for Queenie, who just can't seem to keep up. So many wonderful things attract her attention along the way. There are "pink blossoms," "fuzzy caterpillars," "buzzy bumblebees" and so much more. But one day, Queenie sees an unusual orange furry thing that turns out to be a cat. Her frantic warning squeaks come just in time to alert Mama and Papa, who chase the feline away before it can pounce. The large illustrations, rendered in gouache, vary from spreads to a few vignettes on a page. 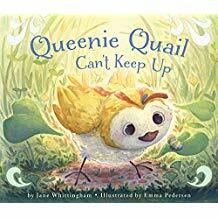 Especially winsome are close-ups of Queenie as she looks backward between her legs to observe a worm or chirps face-to-face with a butterfly. The cat's body stretches across two pages as it observes unsuspecting Mama and her chicks. From the title to the words within, alliteration fills the text. There are "shiny stones," "wiggly worms," and "fascinating feathers." Queenie follows the cat "softly, smoothly, [and] silently." Repetitive words such as "tap, tap, tap" and "hurry, hurry, hurry," printed in color, invite young readers to chime in. VERDICT The lovely illustrations and lyrical language, the pairing of curiosity and caution, and the opportunity for youngsters to join in the reading make this a great choice for group sharing.